Confession: I’m a geography snob…and, of course, somewhat of a food snob. But when it comes to clothes, jewelry, decor, I don’t even have an opinion. Cars? I bought my last one at a fire sale–literally. It had caught on fire, but just the back end. The engine and dashboard were fine; the seats a little crispy. But I’ m digressing. Let’s get back to geography, specifically world geography, or the lack there of in America. 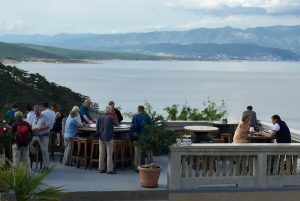 A View from the Island of Krk in Croatia. I recently called my bank to give them a travel alert for an upcoming trip to Serbia. I had tried online, but Serbia wasn’t on their list of options. When the bank representative couldn’t find it either, he asked if it were indeed a country. He had never heard of such a place. And so I began my class. There once was a country called Yugoslavia. 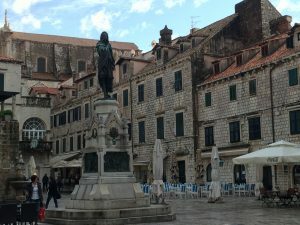 It was made up of six ethnically and culturally diverse republics, including Serbia, Bosnia and Croatia, along with Slovenia, Montenegro and Macedonia. Even though the country was officially proclaimed in 1929, in the aftermath of World War I, it’s second, and larger, incarnation happened in 1946 under General Tito. Tito deemed the new land to be a Socialist Republic; however they were never under the thumb of Russia and their borders were never sealed. The bank representative, trained to be polite, quietly sat through modern Balkan History 101. I spared him BH 201, the part about the not-so-distant war that lasted 10 years and sometimes placed brother against brother in the battlefield. I knew he didn’t go to his nice suburban office to listen to stories about genocide and deeply rooted ethnic hatred, even though everyone should digest these lessons. What I didn’t tell him though was about my relationship to the country. That when I was a student in Germany many of my friends were from Yugoslavia, including my boyfriend. I deemed them the fun people, much more entertaining than the other European students. 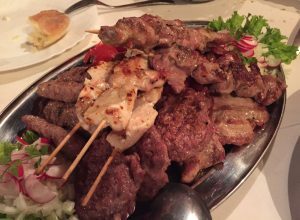 We cooked together in the dorm (each floor had its own kitchen) and ate “Yugoslav-style,” which meant, at least according to them, that everyone ate from the same pot in which the food was prepared. No need for plates. They convinced me that sharing was part of socialism and I must admit I firmly embraced the camaraderie. I also enjoyed washing less dishes. Through my friends I discovered Cevaps, grilled ground meat usually served with a side of chopped white onion and Ajvar, a puree of roasted red bell peppers, sometimes mixed with pureed eggplant. I ate Palacinke, thin crepe-like pancakes stuffed with sweet cheese and maybe jam and discovered a delectable cake named Gibanica, made with the same sweet cheese, as well as poppyseeds, apples and walnuts. 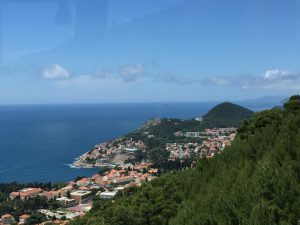 I listened to stories about the beauty of the Croatian coast long before I visited, about the boats you could charter and then sail from one idyllic island to another. I never had the opportunity (aka: money) to go back then, but knew that one day I’d discover the places that I fantasized about sitting in my dorm room. That summer, I joined my boyfriend in Slovenia, in the north. I met him there right after their currency had devalued and we threw worthless money from the windows of his VW Bug (his idea, not mine). 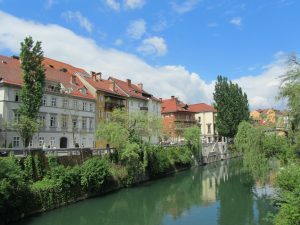 Downtown Ljubljana, the capitol of Slovenia. Even though the talk in Yugoslavia was mostly upbeat and positive, I soon discovered that something was brewing in this country that fate had forced together. I learned about the hatred among the people—the north versus south, Muslim versus Catholic. I suddenly understood why Tito preached atheism and understanding. Many said that one day it was all going to blow apart. And that day, unfortunately, came only a few years later. I was in graduate school then, in Massachusetts, living with a Yugoslavian roommate. Well, she started out Yugoslavian, but soon, when their world turned upside down, she became Serbian. It all boiled down to ethnicity, which is something, I think, is hard for most Americans to truly understand. We had a mutual friend who left a new job and just-earned American masters degree to return to Croatia, his homeland, and become a soldier. While we enjoyed summer in the Berkshires, he went to war. 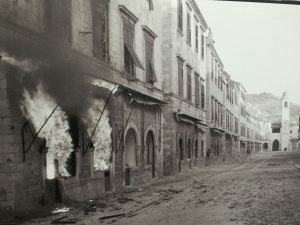 A street in Dubrovnik during the war. Coming soon: A visit to Serbia. This entry was posted on Wednesday, June 22nd, 2016 at 10:26 pm	and is filed under Croatia, Slovenia. You can follow any responses to this entry through the RSS 2.0 feed. You can skip to the end and leave a response. Pinging is currently not allowed.